ONCE A KNIGHT. ALWAYS A KNIGHT. Welcome to Mount Michael Benedictine’s alumni page. The connections made at Mount Michael don’t end with graduation. 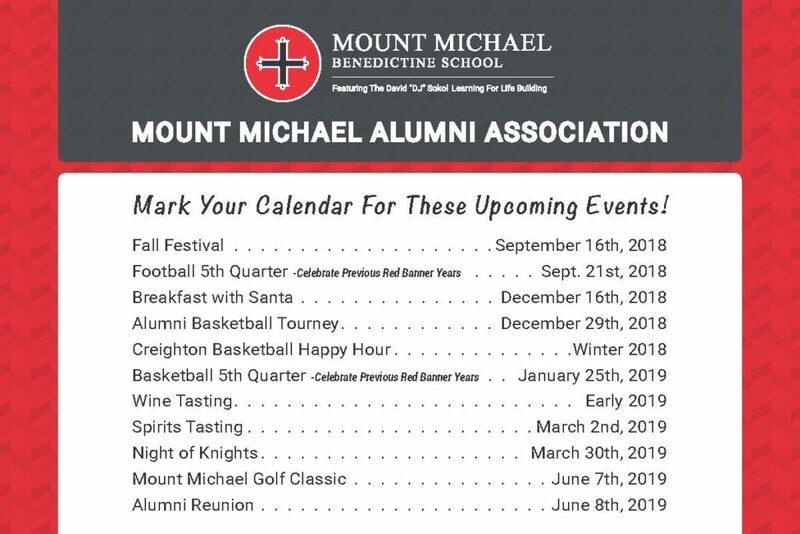 Whether you are an ’18 grad or a ’58 grad, Mount Michael alumni are valued members and we invite you to stay connected. With nearly 2,000 alumni in our network, our hopes with this page are to keep everyone actively engaged with classmates and the entire Mount Michael community. You will also find information about events and opportunities. Accepted an exciting new position? Getting married? Recently received a grant or other award? Expecting a baby? Your former classmates want to hear from you! Keep us posted on what you have been up to since graduation. Please share your news and we will consider publishing it in the Michaeleen!